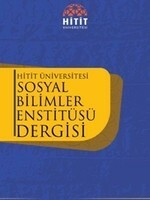 "Hitit University Journal of Social Sciences Institute" [e-ISSN 2536 4944) having begun publishing in 2008 is an academic, international and peer-reviewed scientific journal that conducts a double-blind (confidential) arbitration process. This journal is scanned by national/ international area indexes; such as TÜBİTAK ULAKBİM TR Dizin, EBSCO, CiteFactor, Sobiad, Index Copernicus, Asos Index, Türk Eğitim İndeksi, İdealonline, İSAM, Araştirmax, Acarindex, ResearchBib, Rootindexing and CEEOL, and it is published at least two times per year. This journal has been published only electronically since 2018.